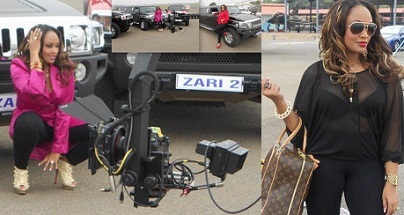 Just when we thought we had had enough of Zari, she sneaks back to our pages and this time in a video shoot for a track that we are yet to know. In the video pictures, you can clearly see her depicting her so called 'fabulous' lifestyle. A fleet of Hummers waiting for her as she pulls out of the South African Airforce flight not forgetting her LV bag and bodyguard are some of the scenes in the video. Meanwhile, less than two months back was her introduction ceremony and her present was a Hummer which she rejected. Now the latest info before us is that the replacement car will be available in a few hours so make sure you check back.